Mockingjay was written by Suzanne Collins. 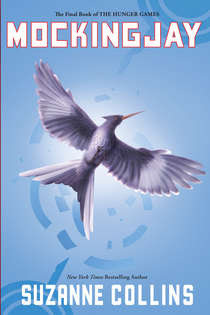 It is the 3rd book in The Hunger Games trilogy. Can Katniss Everdeen win the final fight against the Capitol? THE FINAL BOOK IN THE HEART-STOPPING HUNGER GAMES TRILOGY. My opinion is really completely in my Hunger Games post. Really an amazing set of books. It's not surprising at all that the series is being made into movies. I can not wait to see them. I'm already excited just from seeing the brief trailers. So... how's that NaBloPoMo thing going for ya?